Researchers assessed additional pathways inhibiting the immune system in the tumor microenvironment by evaluating untreated and ipilimumab-treated tumor samples. Researchers initiated a clinical trial testing anti-PD-1 drug nivolumab in combination with anti-CTLA4 drug ipilimumab in men with metastatic, castration-resistant prostate cancer (ClinicalTrials.gov identifier: NCT02985957) based on these results. Previous attempts to treat prostate cancer with either nivolumab or ipilimumab were not efficacious. 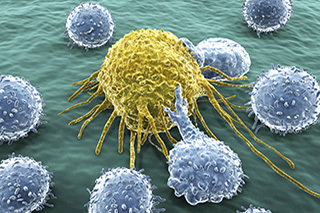 Immune checkpoint inhibitors allow T cells to recognize and attack tumors. Researchers assessed additional pathways inhibiting the immune system in the tumor microenvironment by evaluating untreated and ipilimumab-treated tumor samples in patients in a presurgical clinical trial. In treated tumors, levels of PD-L1 and VISTA, both inhibitory molecules, increased on separate subsets of white blood cells. These results suggest that driving T cells into the tumors, although important, is not enough for successful treatment; instead, inhibition of PD-1/PD-L1 and VISTA is needed. This realization motivated the initiation of the combined immunotherapy clinical trial. 2. Study provides path for new immunotherapy approaches to prostate cancer [news release]. Houston, TX: The University of Texas MD Anderson Cancer Center; March 27, 2017. https://www.mdanderson.org/newsroom/2017/03/study-provides-path-for-new-immunotherapy-approaches-to-prostate-cancer.html. Accessed April 11, 2017.